Hello everyone (especially those of you hopping over from Seeking Lavender Lane!) Welcome! I am SO excited to be sharing my fall home tour with you today! This isn't just any home tour - this week I've paired up with over THIRTY bloggers who are also sharing their fall home tours (so many ideas for you!) and Kirklands, and one lucky winner will get a $1500 gift card to Kirklands! How awesome is that? Without further ado, let's tour my house! My favorite room to decorate is our dining room! I think it is because 99% of the time it feels like I am in the kitchen, which overlooks the dining room, so I really get to enjoy the decor in this space! 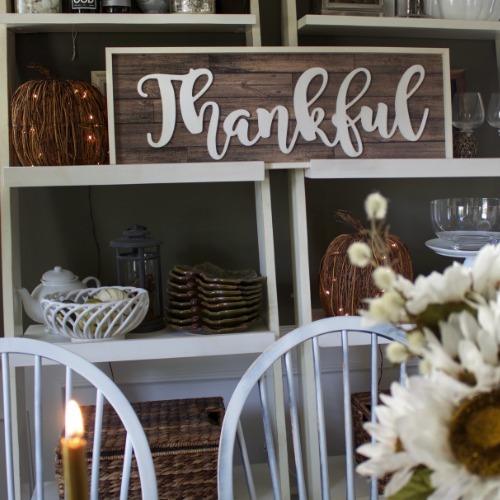 My favorite new piece this year is this "Thankful" sign from Kirklands. It fits so perfectly on our leaning bookcases and makes the perfect statement piece (literally). I was also excited to get some new decor for outside, including this doormat and wreath! They totally liven up our entry and make our home festive. I also LOVE that the wreath lights up! In the family room, I have to keep it relatively simple because most of the time my two boys, Miles (age 3) and Leo (20-months) are dive bombing on the couch, playing trucks, and basically taking over every inch of this space! At this stage in life, I try to keep the decor either durable or out of reach! Here's a few other touches I added to the kitchen. A pumpkin candle and pumpkin scented soap are a MUST! 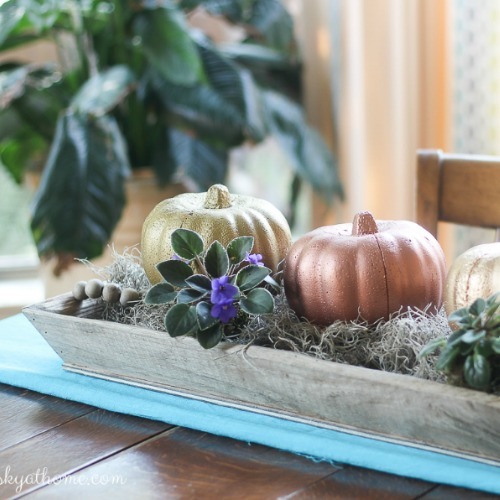 I also love fall decor at golden hour, just as the sun begins to set. Doesn't the room just appear to be glowing? It is so cozy and welcoming! And of course I had to include one more shot of this wreath at night because it is just so beautiful! Hope you all enjoyed my fall home tour! Keep scrolling for links to products, prizes, and the next home on the tour! Enter to win a $1,500 Kirklands Giftcard! The giveaway below will run through 11:59pm on Friday September 29th. Good luck! To continue the tour, head over to Blue Sky at Home to see Carol's fall tour! Here is the line-up for the rest of the week, so be sure to check back every day as the links go live so you can see more amazing home tours! Thanks again for stopping by and thanks to our awesome host Deb at Seeking Lavender Lane for making this all possible! Don't forget to check back all week to see all of the beautiful tours! Last but not least, thank you to Kirklands for sponsoring this post! 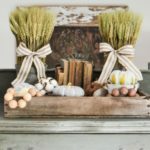 FarmHouse Fall Tour Series Recap! Last week I had the awesome opportunity to be a part of the Farmhouse Fall Tour series with 14 very talented bloggers! Today's post includes a recap of my favorite pics through each stop on the tour and links back to each tour! Be sure to check them all out if you haven't already! 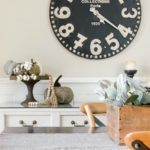 Since yesterday's fall home tour was such a hit, today I thought I would re-share the beautiful tour of my friend Kelly's house from last fall! I think you'll agree with me that her style and her home are i-m-p-e-c-c-a-b-l-e! You can follow Kelly on instagram at @thebellabean! Thanks again for sharing your beautiful home Kelly! 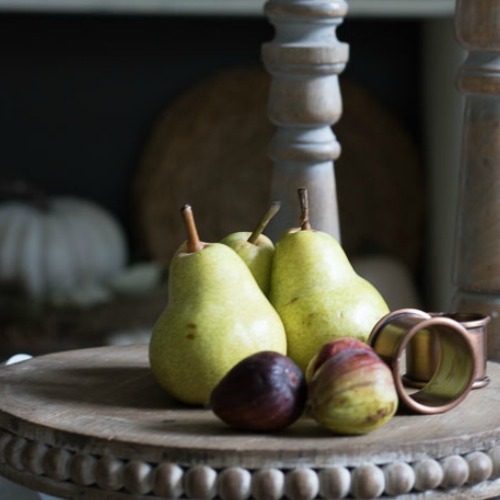 Such wonderful autumn inspiration! The white pumpkin candles, leaf plates, and light-up pumpkins are all from Pottery Barn from several years ago. The faux white and green pumpkins are from Smith & Hawken from probably a decade ago (does anyone else miss that store as much as I do?) and the small white pumpkin soup tureen's are from Williams-Sonoma from probably 3-years ago. This new three tiered stand from Bungalow Home in New Albany, Ohio is the perfect addition to our kitchen! You can display so much with one of these without cluttering up your counter space! I also have a few pops of yellows, golds, and oranges throughout the kitchen to get more in the spirit! The best part of all of the fall decor is how the lights and candles come to life and sparkle as the sun goes down. It smells like pumpkin spice and is downright warm and cozy! Thank you so much for stopping by! Don't forget to check out the rest of the homes on this week's Farmhouse Fall Tour series! They are so beautiful, you don't want to miss it!